La Mancha Restaurant in Kuruçeşme is a great place to go for tapas while enjoying, yet another, amazing Bosphorus view. La Mancha also offers a rich wine list with more than 100 international and local wines. The restaurant has a mixed cuisine of Spanish, Italian and Moroccan style prepared dishes. So besides the tapas La Mancha also offer e.g. Moroccan lamb tagine, Paelia Andalucia and Pasta Bucatini, all served with a very personal touch. The building has three floors and each floor is a different restaurant. La Mancha Restaurant is located on the top floor. As you can see from the picture on the right, La Mancha Restaurant holds a seriously great outdoor bar. 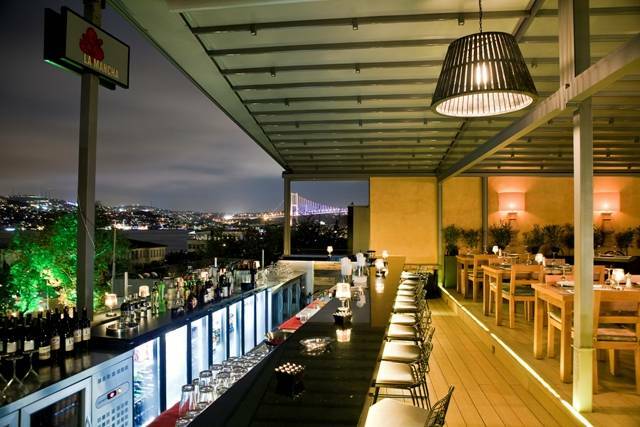 You can sit right at the bar being served by one of the bartenders and at the same time have great views over the Bosphorus. The place is located on the famous Muallim Naci Caddesi with its many restaurants. La Mancha Restaurant is little hard to find if you do not know the area. Many taxi drivers won’t know the restaurant either. It is a little up the hill from the main street.